Next week at Slotastic, you can be among the first to take Realtime Gaming's new Lucha Libre 2 slot for a spin when it arrives next Wednesday. Three or more Scatters trigger the Time to Rumble bonus feature where players win instant prizes by picking one of three final moves for Taco Malo's final round with his over-sized opponent. Picking a move that brings success in the ring wins prize multipliers and potent Fist of Fury free spins. Available April 18-30, 2018 only. Available to all players who make a deposit in April. There is a 30X playthrough requirement for these bonuses; maximum cash-out $200. During regular spins, when Wrestler wild symbols land in all positions on the middle reel they either multiply the win by up to ten times or they jump to other reels. If you have made a deposit already in April, you will get 50 free spins on the new game. Then get another 100 free spins with their next deposit. Fist of Fury free spins are also awarded if Fist symbols appear on reels 1 and 2 and there are 3 Wrestlers on the middle reel. During Fist of Fury spins, up to four reels are held, with Fist scatters in all positions, while the other reels spin. 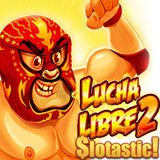 The new Lucha Libre 2 slot will be in Slotastic's online casino for desktop and laptop computers and in its mobile casino beginning April 18th. Slotastic has a free App for Android smartphone and tablet users.